If your Minneapolis garden or landscape plan seems a little empty for reasons you can’t quite pinpoint, it may be that the missing ingredient is rock. There are a number of benefits to using rocks – large and small – in your yard, and we hope to cover some of the most important ones in this post. First it is important to understand that when using any kind of natural stone in a decorative manner, your choice of rock will set the tone for the entire landscape. There are rocks that have a tendency to add warmth as well as others that can brighten a shady area. Then there is texture. Some are smooth, while others are rough and ragged. Selecting a type that satisfies your particular needs in what matters most. For instance, polished river rock makes a great pathway, while granite chunks in a mulched bed provide visual interest. Here are a few of the ideas for decorative rock that you might find helpful. Although they tend to be a bit pricier than mulch, there are reasons you may wish to consider rocks for the purpose of ground cover. Rocks, unlike mulch, do not have to replaced every season. Indeed a rock can last a lifetime. Additionally, the contrast in color with your plans can beautify your garden. 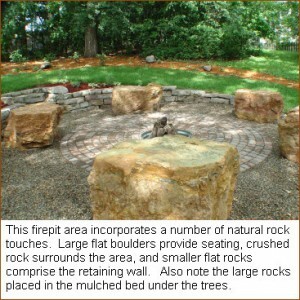 There are a number of ways in which the use of rocks can provide a unique look to your garden. For example, adding a boulder as well as low -ying flowers and small stones can give your garden something of a “fairy tale” look. Similarly, a stepping stone path — in addition to keeping your shoes clean, rocks can provide a lovely contrasting color. At Architectural Landscape Design there are a number ways we can help turn your Minnesota landscape into the dream you’ve always had. We love incorporating natural stone into our designs. In fact, we’ve developed a line of custom outdoor furniture crafted from natural Minnesota stone. These are just a few of the many ways that we can satisfy your Minnesota garden and landscape needs. Whether you need to connect with a Minneapolis landscape contractor who specializes in custom designs, or you simply need a few new ideas for your rock garden, we can help you. Get in touch today! We are now offering free consultations – call us at 952.292.7717 to schedule.